Jennifer Kadish Cassell, husband Marc and big brother Raphael welcomed Matthew Lucas on April 13, 2013. Diver Michael Goldfarb and runner Victoria Petrillo were part of the 15th class of inductees enshrined in Brandeis’ Joseph M. Linsey Athletics Hall of Fame during ceremonies on Oct. 12, 2013. Michael, the first male member of the swimming and diving program to be inducted, was a three-time All-American. He still holds all of Brandeis’ diving records and two University Athletic Association marks. Victoria was a four-time national champion in the 800-meter run, winning indoor and outdoor titles in 1996 and 1997. She was an eight-time All-American. Robert Lang married Melissa Diaz-Viera in San Juan, Puerto Rico, on June 29, 2013. Brandeis alums in attendance included Christopher Morin and Jason Adler. Brenda Bokenyi is in her 12th year of teaching and her eighth year of teaching first-grade Spanish immersion in Portland, Ore. She continues to run regularly; she also enjoys gardening and playing with her black Lab. Allison Make married Yavuz Ozkan on Aug. 3, 2013, in a small civil ceremony at their home in Little Silver, N.J. Despite a threatening forecast, the weather held out, and they were able to be married outside in their backyard, surrounded by family and friends. The happy couple enjoyed a wonderful honeymoon week in the Poconos. They hope to follow it up with a trip to see Yavi’s family in Turkey. 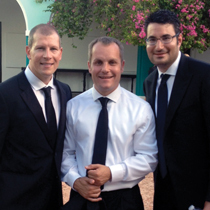 ISLAND IDYLL: Christopher Morin (left) and Jason Adler (right), both ’99, traveled to Puerto Rico to make merry at the wedding of Robert Lang ’99 (center) and Melissa Diaz-Viera.